Surrounded by tropical plants in the garden at Homestay Hong Saeng we are building right now a separate multi-functional small building; tea house, spa and bedroom … a truly beautiful multi-purpose space! We gave it the name Tea@Spa. Relax here with a fresh cup of tea or sample one of our delicious and healthy shakes! Enjoy a chosen Tea Ceremony and learn about the art of drinking and enjoying the spirit of tea. Escape the sun or rain and relax with a friend or simply curl up with an interesting book or one of the e-books from our collection. We serve at Homestay Hong Saeng a range of fine teas, including oolong tea, green tea, black tea, masala chai tea and herbal teas from China, Japan and of course, Thailand. Each tea has been selected for quality and flavour and all are loose-leaf or whole-flower teas. Oolong and green teas contain high levels of anti-oxidants, which help the body to fight off disease. In addition, they help move stagnant Qi or energy, clearing toxins and heaviness. In many cultures, these teas are drank for weight loss due to their ability to move toxins and improve circulation. Many caffeinated drinks such as coffee can raise energy so quickly that one loses their grounding and becomes jittery and scattered. 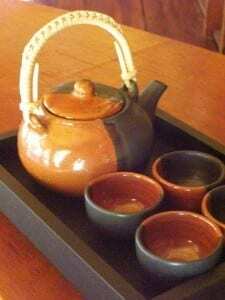 The Qi of tea will rise gradually enough that one does not become ungrounded.